“Skyfall” in China: Good, Bad or Ugly? Skyfall finished its opening week in China last Sunday with a $35 million 6-day gross, a figure that only a handful of films have matched or exceeded in their PRC debuts. So does that mean Skyfall can be considered a hit? Given the China results of prior Bond films Casino Royale and Quantum of Solace, given Skyfall‘s massive success outside of China, and especially given the $102 million total mainland gross of last January’s comparable action film Mission Impossible 4, I believe Skyfall would need to reach $130 million in its China run to be considered a success there. But given its current trajectory after 10 days in release, with a second week drop so far of nearly fifty percent, it seems likely the film will wind up with only about half that $130 million benchmark number. So if my projection is accurate, Skyfall will earn less than 6 percent of its worldwide box office receipts in China. The average Hollywood film released in the PRC this year will earn about 11 or 12 percent of its worldwide revenue in that market. 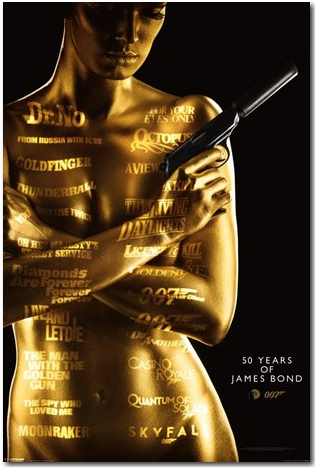 Consider Casino Royale and Quantum of Solace. When those films played in China, both were solid hits that ranked among the top 7 or 8 grossers in their respective years. Quantum of Solace grossed a then-impressive $20 million back in 2008, at a time when China’s total annual box office was only a fifth the size that it will reach in 2013. By that metric, Skyfall ought to gross at least $100 million. For reasons I expressed in an article last week, Mission Impossible 4 is a reasonable and logical comp for Skyfall, and because the Chinese market has grown 30 percent since last January, Skyfall ought to be running 30 percent ahead of Mission Impossible‘s 2012 numbers. 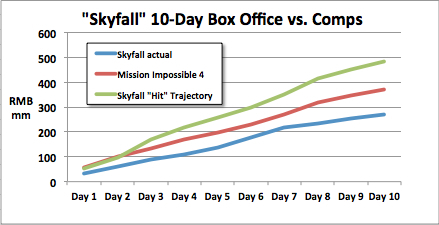 But in fact Skyfall is now running about 30 percent behind. So I don’t think Skyfall can rightly be termed a hit in China. Not “ugly,” not “bad,” but not very good either. In other box office news, the latest installment of the “Pleasant Goat” serties, The Mythical Ark, opened with $10 million, about 15 percent off from last January’s installment. The franchise is showing its age, but since the films only cost a reported $3 million each to produce and they consistently gross at least $20 million, it’s likely that Toonmax will continue to churn them out. Another underperforming opener was Mysterious Island 2, the sequel to the 2011 hit horror flick. The prior film wound up with a $14 million PRC gross, but the sequel scared up just $920,000 in its 2-day weekend debut. The smash hit Lost in Thailand finally ended its run on Sunday with just over $200 million. The $3-4 million budgeted comedy became only the second film in Chinese box office history after Avatar to exceed $200 million, and only the second non-U.S. film (after Japan’s Spirited Away) ever to gross over $200 million in its home territory. All told, cumulative box office for the week was $60 million, a ten percent shortfall from the same week last year. This entry was posted in Analysis, Box Office Reports and tagged Casino Royale, Mission Impossible 4, Mysterious Island 2, Mythical Ark, Pleasant Goat, Quantum of Solace, Rob Cain, Robert Cain, Skyfall by chinafilmbiz. Bookmark the permalink. I think one possible cause for the falling of James Bones series in China might be that the audience is maturing with choice of movies. Now with more foreign films being imported into Chinese market, a movie has to really stand out and be different in order to win the audience. What an informative, strategically responsible article.